Blue sun was challenged to design a series of 25m poles which would allow a cable to be tensioned between them for a span of 160 metres and for this cable to have no more than a 1 metre sag. This meant that an approximate load of 15000 kg would be applied to the cables and subsequently transferred through to the poles. 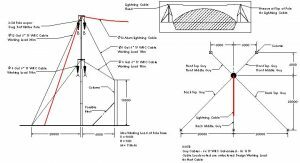 As the pole was designed “as a pole” and not a tower this meant deploying the use of critically placed guy wires as well as ensuring a suitable foundation system was in place. We were chosen to supply road lighting for a major highway project in P.N.G. Comprising over 250 poles fitted with double outreach arms and foundation systems these poles were engineered and manufactured for a tough environment and supplied in a tight delivery time frame of 8 weeks. Blue Sun Poles is a specialist supplier of Lighting columns located within Brisbane, Queensland, Australia. We service all areas across Australia as well as export and can create and supply Traffic and Roadway Poles, Mid Hinge / Seesaw Poles, Tapered Poles, Decorative Poles, Sports Field Poles and , Floodlight Poles for both large and small projects.